Edward, the eldest son of Ethelred the Unready, king of England, was born in Islip in Oxfordshire in about 1003. Edward's mother, Emma of Normandy, was the daughter of Richard, Duke of Normandy. After the death of Ethelred the Unready in 1016, the throne of England passed to Canute the Great. The new king married Emma of Normandy and the couple had a son, Hardicanute. Edward spent the first part of his life in Normandy. 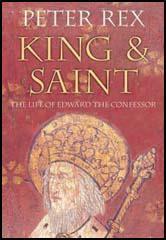 He held deep religious convictions and became known as Edward the Confessor. When Hardicanute became king of England in 1040, he recalled his half-brother to the English court. In 1042, Hardicanute died of convulsions at a drinking party. Edward now became king and one of his first acts was to deprive his mother, Emma of Normandy, of all her estates. Anglo-Saxon chroniclers claimed that Edward had done this because he felt he had been neglected by his mother as a child. For the first years of his reign English political life was dominated by Godwin of Wessex, Leofric of Mercia and Siward of Northumbria. Godwin became the most important of these when Edward married his daughter Edith in 1045. Godwin hoped that his daughter would have a son but Edward had taken a vow of celibacy and it soon became clear that the couple would not produce an heir to the throne. In 1051 a group of Normans became involved in a brawl at Dover and several men were killed. The king ordered Godwin, as earl of Wessex, to punish the people of Dover for this attack on his Norman friends. Godwin refused and instead raised an army against the king. The earls of Mercia and Northumbria remained loyal to Edward and to avoid a civil war, Godwin and his family agreed to go into exile. Over the next year Edward the Confessor increased the number of Norman advisers in England. This upset the Anglo-Saxons and when Godwin and a large army commandeered by his sons, Harold and Tostig, landed in the south of England in 1052, Edward was unable to raise significant forces to stop the invasion. Godwin now forced Edward to send his Norman advisers home. Godwin was also given back his family estates and was now the most powerful man in England. When Godwin died the following year, his place as the leading Anglo-Saxon in England was taken by his son Harold of Wessex . Edward the Confessor and Edith did not have any children. William of Normandy claimed that at a meeting in 1051 Edward had promised him that he would become his heir. Edward's legitimate heir was his grandson, Edgar Atheling. However, on Edward's deathbed in 1066, it is claimed that he nominated Harold of Wessex, as the successor to the throne.